If you have the time, enjoy discovering more about Valletta and Malta in depth by visiting some of the visitor attractions and museums which will inform you enjoyably about the history of Malta. This will help you get more out of the holiday and make all the commemorative plaques and memorials meaningful. There are also open-top bus sightseeing tours that provide an overview of the city - always useful for new visitors. These also offer north and south Malta bus tours with optional stop-off points to see more of the sights. The Malta Experience - a 45 minute audio visual presntation of the history of Malta in a selection of languages. 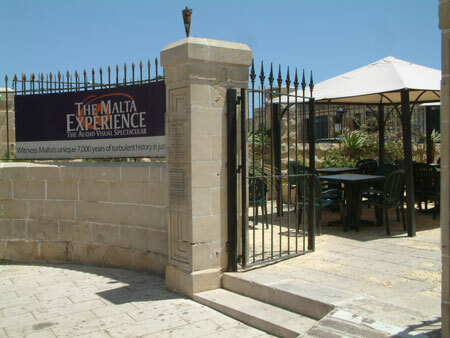 The location is next to Fort St. Elmo in Meditteranean Street and overlooks the Grand Harbour. Gift shop and cafeteria for refreshments. The Knights' Hospitalliers - this retells the story of the Knights of St John. Hospitalliers provided medical services and hospitality for travellers in the 16th century. The Knights left Rhodes and came to Valletta, Malta, to defend Malta against the Ottoman invaders. If you're interested in Knights of old then this could be your scene. Great Seige of Malta - Malta was under seige by the Ottoman Turks when controlled by the Knights Hospitalliers (the Roman Emeror Charles V gave Malta to the Knights). They fortified Valletta and vanquished the Turks when 8,000 additonal soldiers led by Garcia de Toledo landed in Mellieha Bay in1565.